Compatibility pack for optimal Multiplayer experience. 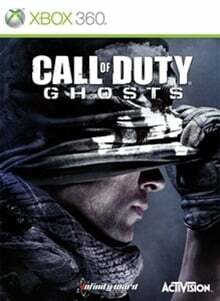 This is a required download for all Call of Duty®: Ghosts players. (Online Interactions Not Rated by the ESRB) The Games on Demand version supports English. This game requires approximately 10GB of free storage space. You can download the game to your Xbox 360 Hard Drive or USB 2.0 Flash Drive with a minimum of 15mb/s read speed. After the initial download from the Xbox LIVE Marketplace, please launch the game to automatically download the remaining game data. The total download size is 10GB and download times will vary depending on internet connection speeds. Outnumbered and outgunned, but not outmatched. Welcome to Call of Duty®: Ghosts, an extraordinary step forward for one of the largest entertainment franchises of all-time. This new chapter in the Call of Duty® franchise features a fresh dynamic where players are on the side of a crippled nation fighting not for freedom, or liberty, but simply to survive. Fueling this all new Call of Duty universe, the franchise's ambitious new next-gen engine delivers stunning levels of immersion and performance all while maintaining the speed and fluidity of 60 frames-per-second across all platforms. Single Player Campaign Ten years after a devastating mass event, the nation's borders and the balance of global power have been redrawn forever. As what's left of the nation's Special Operations forces, a mysterious group known only as "Ghosts" leads the fight back against a newly emerged, technologically-superior global power. Multiplayer In Call of Duty®: Ghosts you don't just create a class, you create a soldier. In the new Create-A-Soldier system, choose the head, body type, head-gear and equipment, and for the first time in a Call of Duty® game choose your gender. New dynamic maps include interactive elements and player triggered events that make the environment evolve as each match goes on. The entire landscape can shift and force you to change tactics and strategies. Call Of Duty: Ghosts redefines how the player moves through the world. The new contextual lean system now allows you to lean around obstacles without adding button combinations or fully leaving cover. The new mantling system allows you to move fluidly over objects, while maintaining momentum. The knee slide allows you to naturally transition from sprinting to crouch to prone. Squads Build your team and take up to 6 of them into battle in the all new Squads mode. This mode takes the best parts of the multiplayer experience and allows you to play either solo or cooperatively with the custom soldiers you've created and leveled up in multiplayer.